Fast response and shipping. Well packed always on time great job. Fast Shipping Thankyou for excellent experience!! Excellent packaging. Great value for the price. Great Price, Real Deal, Normal Large Size. This product is the real deal. 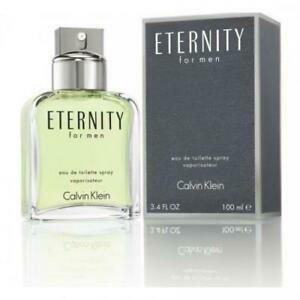 It is high quality and actual "Eternity" by Calvin Klein in the same normal larger size I use to buy at the store, just at a much better price! I have worn Eternity for years and never have got a better price than I did here , it was only 20.00 for 3.4 oz which usally sales for around 54.00 . Let me tell you for the first time in 35 years they made it possible for me to buy two more bottles of different cologne I had wanted to try for years but just could not pay the big prices at department stores . I bought a big bottle of Obsession Water and both were 20.00 a piece . This is funny it was such a good deal that I was thinking something is going to be wrong but sure enough its the real deal and the big bottles . Thank you guys so much will be seeing you again soon !!! I've been using & loving Eternity for 30 years, since 1988, when it first became available! I've been using Eternity for 30 years, since 1988, when it first became available! Everyone (young & old) loves the aroma as I do and knows it's me close by without even looking. My "trademark." Here's to 30 more years!